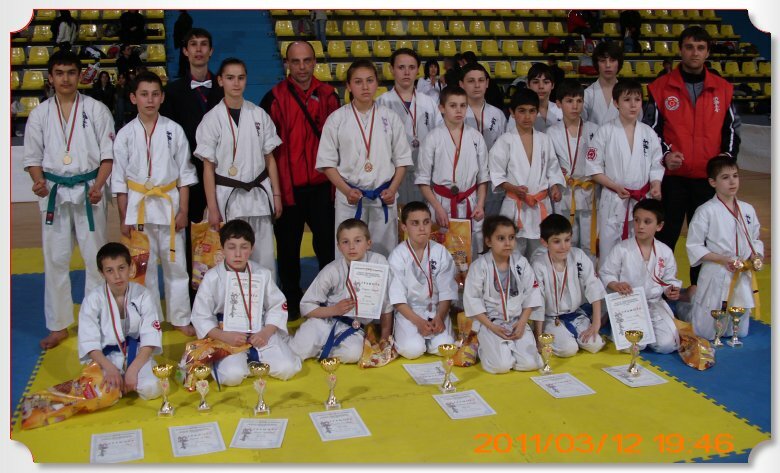 On 12.03.2011 in the "Skaptopara" hall in Blagoevgrad were held the National championships in Shinkyokushin karate for children up to 10 and 14 years of age. The tournaments were very strong and in them took part the young generation karatekas of the Bulgarian Karate-do Kyokushin Federation from clubs of the whole country. SC "Kyokushin" Shumen's team made a very strong performance, winning 8 gold, 6 silver and 3 gold medals. 1. Emil Bachev in the children up to 10 years of age 32kg category, who won his semifinal bout with vazaari after a very strong low kick and then repeated the vazaari victory in his final with a well placed djodan mawashi geri, deservingly being awarded the prize for the best technique in this age group. 5. Simona Stoianova in the children up to 14 years of age 47kg category who in her quarterfinal defeated her opponent from SC "Tornado" Pazardzhik, in her semifinal overcame a competitor of the hosting team with avasete ipon after a very strong ushiro geri and a strong series of fists in the midsection of Blagoevgrad's competitor. This was followed by a very close final match against Denitza Georgieva from SC "Russe". 6. Ivelina Petrova in the children up to 14 years of age 54kg category, who fought a great final match defeating her opponent with avasete ipon after well place shita-ski. 7. Mark Chervenkov in the children up to 14 years of age +57kg category, who won his semifinal and final matches with vazaari. 8. Dzhaner Shukri in the children up to 14 years of age 42kg category, who won his semifinal with ipon after a strong shita-ski. The competitors of SC "Kyokushin" Shumen were able to take part in the National championships for children up to 10 and 14 years of age thanks to the timely help of Municipality of Shumen. Shumen's karatekas continue their training for the National championship in Shinkyokushin karate for children up to 12 years of age and juniors, which will be held on 26.03.2011 in Plovdiv. 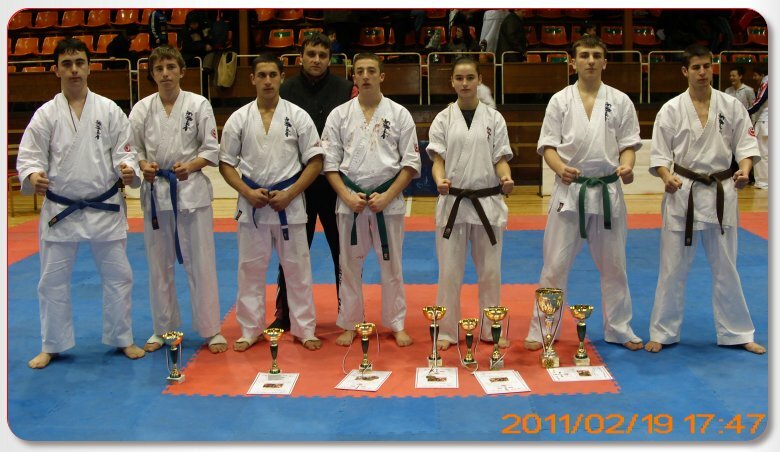 On 19.02.2011 in the "Mladost" hall in Shumen took place the National championship in Shinkyokushin karate for kadets. The competition was also a qualification for the junior national team and this helped to motivate the competitors. The audience was able to witness many close and attractive matches, many of which ended in vazaari or ipon. The competitors of SC "Kyokushin" Shumen made an excellent performance by winning 3 gold and 3 bronze medals in kumite and kata. In girls kadets kata Simona Stoianova became republican champion. She still competes in the up to 14 years of age categories. Georgi Iordanov took third place in kata. In kadets 55kg the european champion Bogomil Tiholov gave his opponents no chance, winning his both his semifinal and his final match with vazaari and deservingly claimed the top of the honorable ladder, becoming republican champion for the eight time. The judges also decided that Bogomil Tiholov would take the prize for the best technique in the event. The other gold medal for Shumen's club was won by Georgi Iordanov in kadets 70kg. Georgi won his semifinal and final matches with ipon, after defeating his first opponent with a very well placed chudan hidza geri and in his final knocked his opponent out with his very strong shita-ski. Thus the young karateka became republican champion for the fifth time. 3.Denis Muzikiarov in the kadets 75kg category. Everyone of these boys train under Aidan Ahmedov from the affiliate of SC "Kyokushin" in Tzarev Brod in the "St. St. Kiril and Metodii" school and have shown great technical growth in their game over the last year. The national championship for kadets was held with the help of Municipality of Shumen and the ICON firm. SC "Kyokushin" Shumen's competitors continue their training for the upcoming National championship in Shinkyokushin karate for children up to 10 and up to 14 years of age, which will take place on 12.03.2011 in Blagoevgrad. 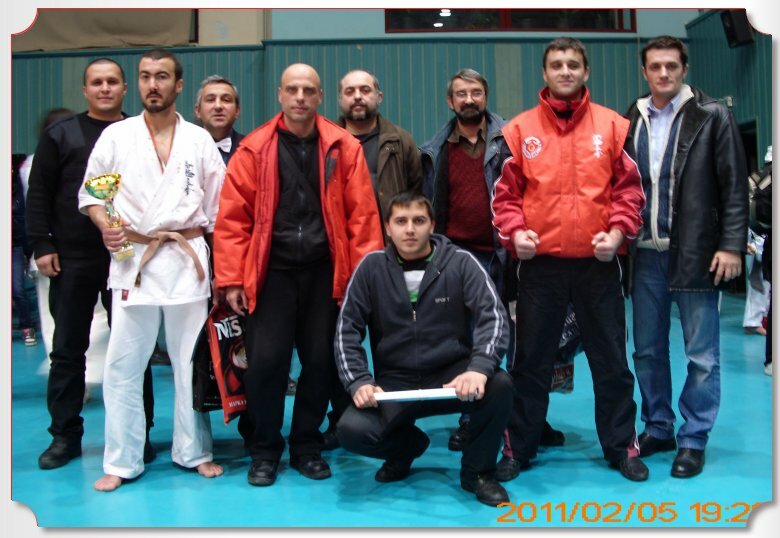 On 05.02.2011 in the "Sikonko" hall in Sofia was held the National competition in Shinkyokushin karate for men and women in kata and kumite. The competition was very strong, in the event participated competitors from clubs of the whole country and the audience could only appreciate the close and attractive matches, many of which ended with vazaari or ipon. The competitors of SC "Kyokushin" Shumen made a great performance, winning 1 gold and 1 silver medal. In the men up to 90kg category republican champion became Nikolay Davidkov, who in his first match defeated his opponent from "Trakia" Plovdiv by referee's decision, in his semifinal won in regular time against a competitor of Sofia and then decisively took his final match with avasete ipon against a competitor from Plovdiv after a very well placed low kick. A silver medal for Shumen was won by the chairman of the club Stoian Obretenov IInd dan, who competed in kata. A good performance for Shumen was made by Aidan Ahmedov as well in the 80kg category, who in his first match defeated his opponent from Blagoevgrad with avasete ipon after a strong series of fists in the midsection, but for his next match he was unfortunately paired up with one of the favourites in the category Nikolai Varshilov and our fighter was eliminated. Many of the Shumen team's friends were also in attendance - competitors from four generations, who gave them their heated support during the competition and this unlikely meeting only added to the satisfaction of the achieved results. The competitors of SC "Kyokushin" Shumen continue their preparation for the upcoming National competition for kadets in kata and kumite, which will take place on 19.02.2011 in the "Mladost" hall in Shumen.